Active learning often means revamping classrooms to enable more collaborative, hands-on student work — and that can be costly. Here's how to achieve the pedagogical change without the high expense. Active learning is a great way to increase student excitement and participation, facilitate different kinds of learning activities, help people develop skills in small group work, promote discussion, boost attendance and give an outlet for technology usage that stays on track. It also requires remaking classrooms to enable that hands-on, collaborative student work — and that can often mean a six-figure price tag. 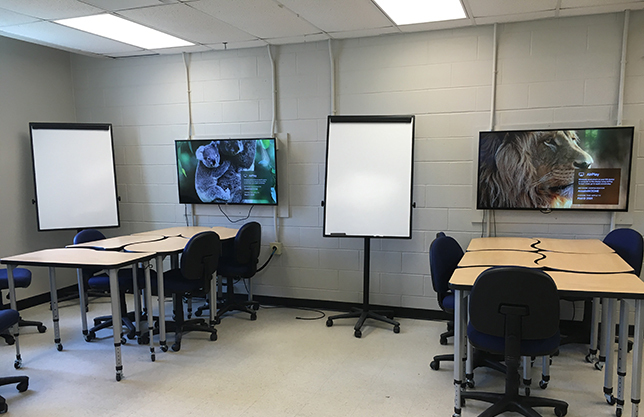 But at Saint Anselm College in Manchester, NH, a $12,000 experiment proved successful enough that the institution now sports two permanent active learning classrooms as well as a brand-new active learning lab. Here are the 10 steps this school with just under 2,000 students followed on its road to active learning victory. Saint Anselm's journey began with discussions at its annual summer faculty institute, which examined new ways of teaching, flipped classes, project-based learning, active learning "and things of that nature," reported Kim Round, head of Instructional Technology and Design (IT&D), a division of Information Technology. While many faculty members wanted to "explore those types of pedagogies," they lacked the physical locations on campus to do so. The Saint Anselm IT&D team was certainly familiar with active learning spaces available at larger institutions. The challenge was figuring out how to pull off something comparable on a small budget. That's when the idea of creating a prototype space surfaced, to simulate the full experience for Saint Anselm instructors. 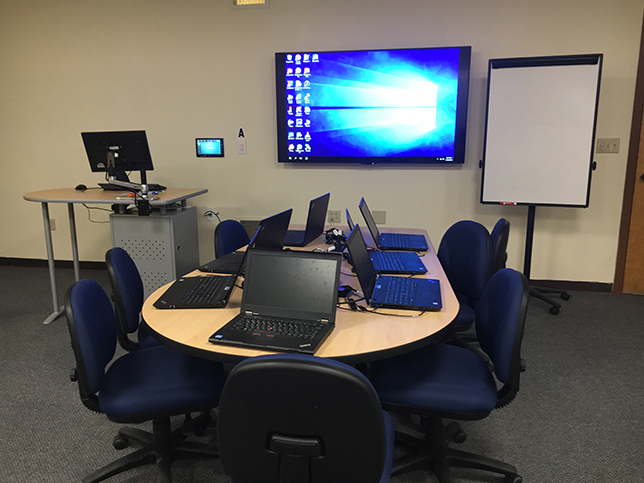 IT&D put together a modest proposal to create an experimental classroom, which called for converting an existing seminar room to the new use. That required sign-off from Academic Affairs and the Registrar's Office, which would have to pull the space out of the regular classroom schedule. The only caveat: The Registrar's Office wanted assurances that if the room needed to be used in a pinch as a traditional classroom, it could "morph that way." College CIO Adam Albina secured those approvals, and IT&D set about adding the gear and furniture needed for the experiment. The group also committed to having a person in the room during classes to provide technical support by "manually" handling the various feeds to the big displays. As a result, availability was limited; instructors could only schedule the room for specific assignments. By September 2013, the experimental classroom was up and running. One way the college kept to a lean budget was by leveraging existing modular furniture that made up the space. A faculty member had acquired rolling chairs and tables through a grant for a program that only ran in the summer, leaving the equipment available "for us to use in the fall and spring," said Round. That meant the $12,000 budgeted for the experimental space could be dedicated to technology — multiple LED flat panel displays and an Apple iPad for each "pod" (the name given to the workspace groups where students teamed up). The iPads were kept in a locker in the room, "so they don't walk," said Round, and were made available to students acting as scribes for their groups, lacking their own devices or needing to head out for field work. The first wave of interest came from those instructors who had already expressed a desire to teach in new ways. "For our initial folks, it seemed like a really easy fit," Round noted. During the subsequent summer institute, those professors shared some of the projects they'd undertaken. "We find we have the best luck when faculty are presenting to other faculty," she added. Those efforts had the expected effect: The examples helped woo others who were "going to need a little bit of support" in adapting their activities from a traditional lecture space. Initial feedback from students was entirely informal and highly positive. Round would position herself outside the room, where she could hear students' reactions as they entered. "They'd say, 'Wow, we're going to be in here?' You could tell they were really excited." Later, she began to see students "voting with their feet." When the space wasn't hosting a class, the IT&D team would find groups of students using the room as a study space or to get ready for exams, where they could "throw up" documents and study guides on the displays and work on projects together. While the classroom operations were very much "push-button," said Round, faculty members needed time to get comfortable with the technology. Eventually, one enthusiastic instructor became adept enough to troubleshoot problems on his own in the experimental room. Because he no longer needed the tech support help, he asked IT&D if he could book the space all semester. Round's response: "Fine with me!" That was one more clue indicating that the prototype was a success. Armed with anecdotal feedback, the institution pursued grant money to make the space a permanent fixture. The Alden Trust provided $80,000 and the college added an additional $3,000 — enough funding to equip two such classrooms, which opened in January 2016. The budget also covered the acquisition of Crestron collaboration units to enable multiple users to control what showed up on the big screens. As Round explained, now the instructors could either take over all of the flat panels with what they were presenting, present from a specific student device to all the screens or allow individual groups of students to display their own work to their own screens. With the permanent classrooms in place, the college set about gathering more formal student perceptions of the new spaces. A survey in fall 2016 and spring 2017 found that 84 percent of students believed the active learning classrooms "promoted engagement"; 80 percent said they enriched the learning processes; and 74 percent agreed that the spaces allowed for "flexible approaches." "This was the first time these students had experienced an active learning classroom," observed Round, "so we felt these were good numbers." The new spaces were successful enough that when it came time to refresh a traditional computer lab whose furniture was showing its age, faculty proposed the active learning approach. After all, they pointed out, the classes relying on that lab — computer science, business, economics, statistics — were already doing active learning with their labs and team projects. Selling the administration on the new approach was easy because of the groundwork already laid. "We could either do this with a forward-looking perspective or we could replace it just as it was," said Round. In this case, she noted, "The active learning lab really became the institutional vote of confidence." However, some aspects of the active learning model wouldn't fit. For example, in the other active learning classrooms, seats and tables can be apart or grouped together. For a computer lab, however, in order to accommodate power needs without having cords running across the floor, the pods really needed to work at a single table. Plus, instead of using individual monitors at each station, the computer lab pods were outfitted with laptops — six at each of five tables with the ability to expand to seven students in each pod. Also, an initial proposal to put the instructor station in the middle of the room in a "hub and spoke" design was nixed by faculty. They wanted to be closer to the main display in order to point out things on the screen. Round's suggestion that they simply use annotation tools, which would enable them to stay in the middle of the group, fell flat. Likewise, to avoid the problem of having a faculty member hidden behind rows of individual monitors, Round suggested an instructor table that sat a bit higher than the standard desk height. That idea got a thumbs-up. The new lab was scheduled to open in January 2018, following a fast-paced installation over the holiday break. Timing posed a problem: how to help instructors who would be teaching in the new space visualize it before they returned. To overcome the challenges, months earlier IT&D began communicating with faculty for input on furniture and questions such as what size individual computer screens needed to be. By the time instructors were leaving for the break in December, they knew they'd be coming back to a lab that was "going to be completely different," Round said. As a result of continual communication on the progress of the project, most came back a week before classes started in order to try out the new room. Now faculty seek out access to the active learning spaces, Round said. But really, she emphasized, the classrooms are just "one tool in the toolbox." "Saint Anselm College has amazing professors. Many are dynamic on their feet, and the lecture space is the perfect environment to learn from them," she added. The addition of the new classrooms "doesn't mean that all of our spaces should now become active learning spaces. What we're doing is contributing to a taxonomy of pedagogical approaches."